JuanaMikels.com: Happy Birthday Today to Elisabeth Elliot & Advent Devotions as we Near Christmas Day! Happy Birthday Today to Elisabeth Elliot & Advent Devotions as we Near Christmas Day! A big "Happy Birthday!" to wonderful Elisabeth Elliot who celebrates her 86th birthday today! For those of you who know and love Elisabeth Elliot, you surely remember what she use to say about her age before she resigning from speaking a few years ago: "I'm not getting old, I done got there!" Her requests to speak did not slow down either, the older she got. They just kept coming. Many of you may remember that I almost got to see her and her husband Lars again this past summer. They had planned to stay with our family for a couple nights, and I had clean sheets ready on their bed, and supper planned. I suddenly got a phone call that they had been involved in a car accident four hours away from our home. Elisabeth did not sustain any injuries and was released immediately, but Lars had to be airlifted to a hospital and had neck surgery a day later. Elisabeth's daughter came and took her to her home, as Lars recuperated in the hospital. Lars had told me that Elisabeth's memory was all but gone, and I had braced myself for their visit, knowing that the woman who had so inspired me to walk with Christ, who had pointed me to so many scriptures, who had endured so much in her own life, now is totally on the receiving end of being cared for. I want to be for others what she was to me, pointing anyone who will listen to Jesus Christ. Elisabeth began each radio program on her program with "You are loved with an everlasting love, that's what the Bible says, and underneath are the everlasting arms." Oh, how I miss her clear, no-nonsense voice with her Biblical teaching. Oh Lord, help me to be faithful to give out what I've been given, and to be willing to continue to just simply be a voice that you can use to point others to you. Oh, Lord help anything that I write and say be only what comes from you, and may it help those who read by getting the scripture into their hearts and lives, and mine too, Lord. Help us to be authentic followers of Christ, allowing Him to truly make a difference in our lives as we yield to His and get rid of our own agendas by your grace. Amen. 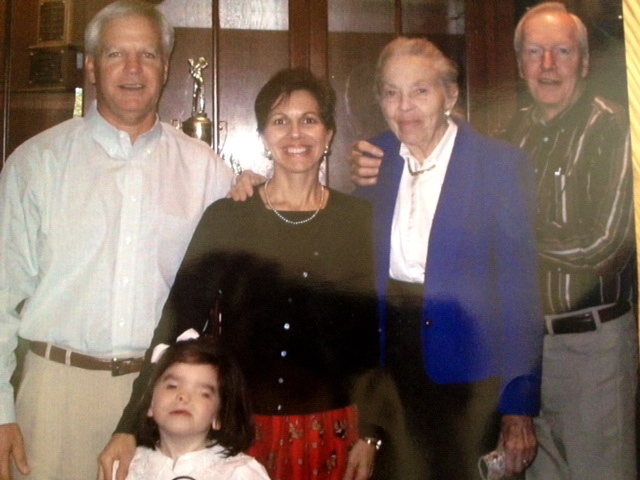 Below is a picture of Lars and Elisabeth with Terry, Mary, and me when they came to visit about 10 years ago. Just before they left town, Lars wanted to drive by the fair and go see the animals. They left, and my husband and I regret that we did not offer to take them. I was busy homeschooling three of our four children but we should have realized that our time with them would have been better than any "school" we had planned. I don't remember what subjects we picked back up after our day and a half visit, I only remember watching them leave our driveway and realizing soon afterward that we should have gone with them to the fairgrounds. Many have asked me how I came to know such a wonderful woman of God as Elisabeth Elliot. I was just a listener to her radio program. I was being helped in so very many practical ways from listening to Elisabeth's 15 minute program (the first of which was getting my hair off the bathroom floor, something Terry had been asking me to do for years!!!). I made her an audio tape which was easier for me than writing, and I spoke it into the recorder while everyone in the house was asleep (I was up anyway because Alex was a little newborn). We had just returned from a vacation at the river, when I sat down to read the mail. I saw her handwriting with her name and address on the envelope and I started to cry! My little ones gathered around as I read it with tears streaming down my face. That would be the first of about 35 letters we would exchange over the next decade. I never dreamed that she would ask me to be a guest on her radio program or that she would travel to my home on two different occasions. It was Elisabeth Elliot that asked me to write a book. Actually, she told me that I needed to write 3 books: one on my testimony, one on family life, and one on order in the home! She said call the one on your marriage testimony, "Don't Dump Him!" She added, "Be sure to include all those stories you told me, too." Ten years later, I wrote the first book she had asked me to write. I included all the stories she asked me to include. My agent is still looking for a publisher. (We have had about 22 rejections!) I'd appreciate it if you could send up a prayer right now for a Christian publisher to just step up, and say that they want publish it. God answers prayer!!! Moving on to advent devotions!!! I hope some of you have been able to read the wonderful Word of God that I've been passing along to you for simple advent devotions with your family. Oh, how it can be hard with all we mothers and wives do at Christmas, but just get the scripture into your husband's hand and make it easy for him to read it! God's Word will not return void. It will also help us keep Christ the center of the celebration! Yesterday's blog had tonight's scripture. You can find it here. For tomorrow night: Read Luke 2:15-20 about what the shepherds did after the angels left them. They took action, and went to see Jesus! We see Him each time we open our Bibles and read and pray. They naturally spread the word of what they had seen and they praised Him. Are we spreading His word? Do we take time to simply praise Him without asking for anything? 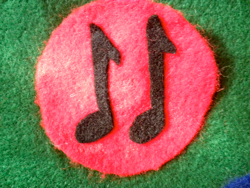 Make musical notes reminding us of the shepherds who went away praising God and telling others about Him. Sing Angels We Have Heard on High. Have fun! I’ll try to give you all the rest through Christmas Day tomorrow, as we all probably have a little wrapping, cooking, or shopping to do! Tomorrow is my mama’s birthday (she is one year younger than Elisabeth!! ), and we are taking her to dinner. Get ready on Christmas Eve or Christmas Day to pull off the tree each drawing and remember what it represented; you will be so glad you prepared your heart to meet Christ on Christmas.